1. How to custom the import Excel spreadsheet to Kanbanize? Importing cards is the quickest way to populate your Kanban board without having to create and fill in each card manually. Important: the system allows you to import cards on the Cards Workflow lane only. There is no way to import Initiatives using Excel. 1.1 Create an xls or xlsx file that needs to be properly formatted so that your data can be matched to the cards' fields in Kanbanize. - in the spreadsheet, give descriptive names (column headers) to the columns matching the following card fields: 'title', 'description', 'priority', 'assignee', 'color', 'size', 'tags', 'deadline', 'ext link', 'external link', 'template', 'type', 'type name', 'column', 'column name', 'lane', 'lane name', 'comment', 'parent','creation date'. - Only the field “title” is mandatory, all other fields are optional. - If you want to import tasks and link them as child cards to existing cards (Parent and/or an Initiative), your Excel file should have a column header named “parent” with the list of the existing Parent/Initiative IDs on your board, e.g. 2756, 3281 etc. Example: If you import "Table 1" (see the image below), the system will create and link 4 child cards (named Test 1, Test 2, Test 3, Test 4) to the existing Parent /Initiative ID 2756 and 1 child card (Test 5) to the existing Parent/Initiative 3281. Note: Cards 2756 and 3281 are existing cards on the Board. - Custom fields can be imported, if they have been assigned to the board prior to the import. The column headers in your spreadsheet need to match the name of the Custom field you wish to import. Example: The column headers in Table 2: Sign off by; Version; Severity and Customer are custom fields that have been created and added to the board prior to the import. 2. How to import an Excel file to Kanbanize to populate your board? 2.1 Open the board into which you wish the cards to be imported. 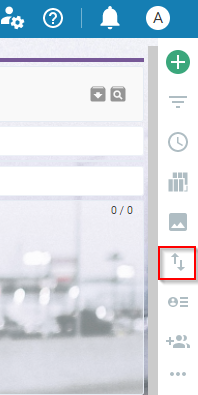 Then click on the Import/Export icon, located on the sidebar to the right of your Board interface. 2.2 Click on "Browse…" and choose the xls or xlsx file from your computer. You can check the sample files below - > "See Sample files". 2.3. Once the file is uploaded, the system will validate your data for compatibility and the validation status will be displayed. If a card field is not recognized, the values will not be imported. For example: in the screenshot below (Image 1), there is a typing mistake in the title of the column "Tags" and the data is not recognized by the system. 2.4. If you need to edit the file, cancel the import by closing the import window. Edit the information in your file and import it again. 2.5 If all columns are recognized as card fields -> select Import. You will get a System Notification message -> click OK. Your import has started and you should see the cards appearing on your board. When the import is completed, you will receive an email with the import status. Note: If you have not defined a column for the import, the cards will be created in the column and swimlane set as default in your Personal Board Settings. Please, learn how to update cards using Excel the following dedicated article.